A research team at the Center for Nanoparticle Research, within the Institute for Basic Science (IBS), has succeeded in developing a wearable and implantable device, that measures electrophysiological signals and applies electrical and thermal stimulations. It provides information on muscle and cardiac dysfunctions, and thus could be implemented for pain relief, rehabilitation, and prosthetic motor control. Being the first soft implant able to record the cardiac activity in multiple points of a swine heart, it is expected that this prototype, described in Nature Nanotechnology, will contribute to the research and production of future bioelectronics. IBS researchers have used this new device on human skin to record the electrical activity of heart and muscles, that is electrocardiogram (ECG) and electromyogram (EMG) respectively. Thanks to its softness, elasticity and stretchability, it can follow the contours of flexible joints, such as the wrist. Worn on a forearm, it simultaneously monitored EMG signals, and delivered electrical and/or thermal stimulations that could be employed in therapeutic applications. Figure 1: New wearable device capable of recording the electrical activity of the heart and muscles, as well as delivering therapeutic electrical and thermal stimulations. It is suitable for flexible joints, like the wrist, and allows reliable heat transfer even when the wrist is flexed or extended. The research team has also produced a customized large mesh that fits the lower part of a swine heart. Wrapped around the heart, the implant can read signals from the entire organ to identify possible lesions and help recovery. For example, it was able to register the change of ECG signal caused by an acute heart attack. The mesh is stable during repetitive heart movements and does not interfere with the heart’s pumping activity. Figure 2: The mesh implanted around a pig’s heart was able to record cardiac activity in multiple points. The electrocardiogram (ECG) produced by the device detected an abnormality (ST elevation) caused by an acute heart attack (ischemia). 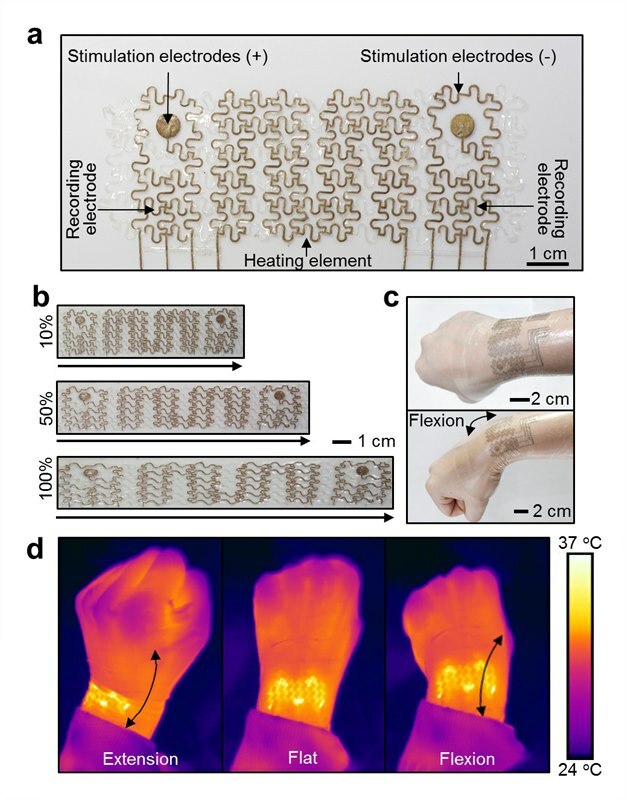 This stretchable and conductive patch is created by gold-coated silver nanowires mixed with a type of rubber, called polystyrene-butadiene-styrene (SBS). Conventional silver wire-based conductive rubbers have had limited biomedical applications because silver is toxic to the body. In this study, the gold sheath prevents both silver’s leaching, and corrosion caused by air and biological fluids, such as sweat. Video 1: Stretchability features of the gold-coated silver nanowires. IBS researchers found the optimum composition of: gold-coated silver nanowires, a rubber called polystyrene-butadiene-styrene (SBS) and hexylamine, that maximizes biocompatibility, while maintaining high conductivity of approximately 41,850 S/cm and maximum stretchability of 840%. Future research plans include maximizing conductivity and stretchability even further by designing novel, non-toxic materials, and studying the therapeutic effect of the mesh in cardiac diseases. IBS was founded in 2011 by the government of the Republic of Korea with the sole purpose of driving forward the development of basic science in South Korea. IBS has launched 28 research centers as of March 2018. There are nine physics, one mathematics, six chemistry, eight life science, one earth science, and three interdisciplinary research centers.